The final conversation was about microclimates. Master Nishioka was describing to me how important it was to match a tree to its structural use in the building, based on where on the hillside it grew. “Valley trees are too wet for most uses, trees at the top of the hill sprout a lot of branches because they don’t have to compete and are very knotty, but trees from the middle slopes compete with others and have long trunks with branches clustered toward their crowns. Those make the best beams, because they’re straight and fairly free of knots.” He went on to describe how trees from the north face differ from those found on the south, and so on. This is no doubt something that most experienced carpenters know; that the environment trees grow in shapes their function as wood. I’m also familiar with this same type of issue relative to grapes grown for wine. Winemakers increasingly are marketing their better wines not just on vintage, but on the particular hill slope the grapes grew on, for example. And yet when we match people to jobs, well oftentimes we don’t even try. Job descriptions are created in the general, not in the particular, and although some of this production line approach may be suitable for certain industries, it is not suitable for knowledge work. If mission performance suffers, the usual management response today is to find fault first with the person, not with the job design. We would be more productive and more in balance with nature if we reversed the response. After all, job design is generalized; the person is not–each of us is the results of a particular path we took in life, none of our trillions of steps can be retraced. It strikes me that if people are indeed our most valuable resource (jargon sigh), then we should care as much as carpenters and winemakers do to take full advantage of their individual and particular talents. 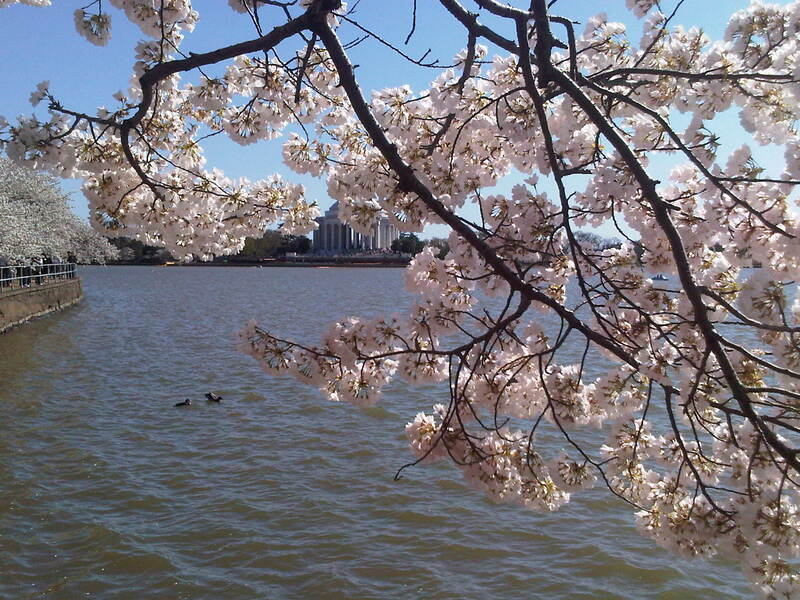 Speaking of trees, nature, and balance, the cherry blossoms were at their peak yesterday in Washington D.C.
David Warlick is a North Carolina-based educator and consultant who keeps a blog, 2 cents worth. His most recent posting describes the transition education is making, as a result of the information, communications, and technology revolution, to personalized learning. As someone who believes work itself will be reconceptualized in the next decade or so, I found many parallels between education’s major transition points and where work is likely to go. Indeed, it is hard to imagine how we could ever take individuals who have learned through the process he describes and then shoe-horn them into jobs as they are currently designed. Personalized work follows along similar lines. What do I mean by personalized work? Most jobs today are still designed according to some archaic position description, this is certainly very common in the government environment. These descriptions are infrequently updated. (I remember at the CIA it was always a very bureaucratically fearful time when the professional job redescribers descended upon your office.) (This makes me think of another post that would be fun to work on: When Bureaucrats are Scared, but I digress.) But if you just think about it, doesn’t it seem nonsensical that in this day and age we would organize the work of our mission around position descriptions that can frequently, I think, be more than a decade old. But it’s not the vintage of the description that’s the real sin, it’s the fact that you could never find a single person who could perfectly perform all the tasks required. So because of the perceived need to order work in ways that the bureaucracy and pay system can best handle, we actually make inefficient use of people, our most important resource as we are often and unattractively reminded. Is there another way to organize work? YES!! Innovative organizations are beginning to work with new designs that actually allow them to match tasks to the best-suited individual. And they use technology to mash the two up. Every manager needs to visit and become familiar with Amazon’s Mechanical Turk. (I’ve made more than forty dollars there so far as a worker, enough to finance my MP3 purchases, but I digress.) At Mechanical Turk, large missions and jobs are being atomized into minute tasks, allowing individuals to self-select the tasks they are both good at and enjoy. What a concept!!!! I actually believe this approach could be applied to many tasks, including some missions of the federal government. Another approach to personalizing work is to bring the aspects of game design into the work environment. It is an odd phenomenon that millions of individuals, many of whom have important positions in their analog lives, voluntarily and happily spend hundreds of hours a year playing computer games such as World of Warcraft. They solve complicated problems, collaborate and form trust relationships with people they’ve never physically met, and all for very little tangible reward. And yet some, when they come into work, mail it in. What is wrong with this picture? What is it about how work is designed that is demotivating, while game design engages individuals? Could it be factors such as immediate feedback, transparency, personalization? For more on this topic, check out recent books such as Total Engagement for eye-opening discussion on why games are not the opposite of work. Anyway, this posting is already too long and there’s still much more to say and do on the topic. These changes are fueled by technology, but I don’t in any way consider myself a technology expert. I associate myself with David Warlick’s own description of himself: Technologists get excited by the light. I get excited by what we can shine that light on.